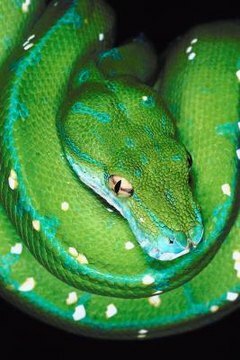 The emerald tree boa and the green tree python are both big green snakes. Even though they come from two unrelated snake families that live on opposite sides of the planet, each could easily be mistaken for the other. How they are alike, and how different, is a tale of parallel evolution. Parallel evolution occurs when two unrelated, or barely related, organisms develop the same characteristics because of similar factors in their environments. A tropical rainforest, wherever you find it, is always warm, wet and green. Somewhere back in time, two different kinds of snake learned to live in the canopy of these forests, one in South America and the other in Australia and New Guinea. Because their habitats were so similar, the two snakes developed similar ways of hunting. They adopted a bright green color with white markings to blend in with the leaves around them. They coiled themselves in a heap draped over a branch, holding onto the branch with their tails and placing their heads in the center of the coil so they could strike at prey without falling. Both constricted their prey, typically small mammals. As much as they are alike, the emerald tree boa and green tree python aren't identical. There are anatomical differences, some apparent only to experts, such as the size and shape of head scales and the number and location of heat-sensing pits in their snouts. The young of both are colored differently from the adults, but yellow juvenile pigmentation occurs in green tree python hatchlings, never in those of the emerald tree boa. The most significant difference between the species lies in their methods of reproduction: the emerald bears live babies, while the green lays eggs. Since both are from tropical jungles, the emerald tree boa and the green tree python require similar quarters and maintenance in captivity. The habitat needs carefully controlled temperature and humidity, and must have branches for them to perch on, since neither spends much (if any) time on the ground. While both snakes are popular in the pet trade, keeping and breeding them is for the experienced enthusiast, not the beginner. The green tree python is widely considered the easier of the two to manage because it has a milder temperament. Those familiar with them describe the emerald tree boa as more temperamental and aggressive, and its bite is said to be more painful because of its unusually large front teeth.